Bussroot is a creative design company based in Tonbridge, Kent specialising in branding, websites, brochures, logo design, stationery and other marketing material. It doesn't matter if the job is large or small, we work with a diverse range of businesses. Innovation is the hallmark of our work and our strength lies in the quality, and friendly one-to-one, speedy service. Brief: To create a new website that showcases the beautiful bespoke hats and the fantastic craftsmanship and quality. What We Did: We produced a very clean and contemporary site where the hats and how they are created were the main focus. After having a professional photographic day with a superb model we were able to create 'lifestyle' images that we used for the sliding headers on the website. The website was styled with subtle colours and sympathetic, modern typeface. We created a new monogram for the logo that we used throughout the site in a pattern and with various aspects to highlight services. The site is easy for the client to upload new images and maintain the content. The website is phone and tablet responsive. Brief: To create a new website that showcases Louise's work in a visual and minimilist way. What We Did: We produced a very clean and contemporary site where the sculptures were the main focus. We used gentle transistions in the large header and navigational arrows to scroll through. The site is easy for Louise to upload new images and maintain the content herself. The website is phone and tablet responsive. Brief: To create an online presence with a booking facility for clubs. 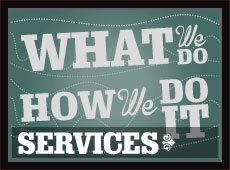 What We Did: Active Primary Sports specialise in pre and after school clubs, holiday clubs and football clubs for kids. As well as a strong online presence, we gave them the facility for parents to be able to book their children onto the clubs and pay online. We also produced an event diary and daily/weekly register to streamline their daily business systems. Client: Coronis International; Evacuation, Repatriation, Medical Expenses and Accidental Death cover. 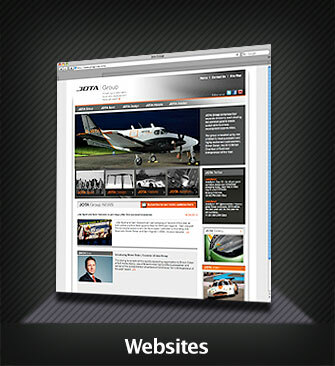 Brief: To create a corporate and modern website to highlight their services. 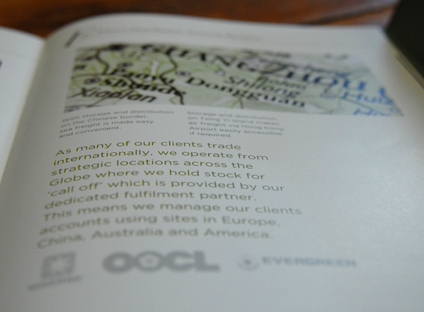 What We Did: Created a new brand to complement their repatriation services. 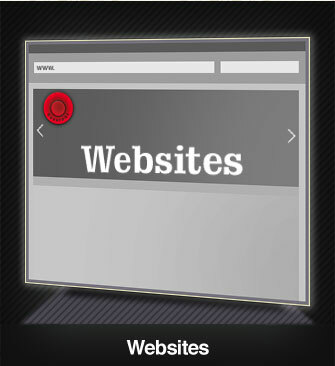 To highlight their services using a dynamic visual and clear navigation. We produced an online application with a summary and price area. 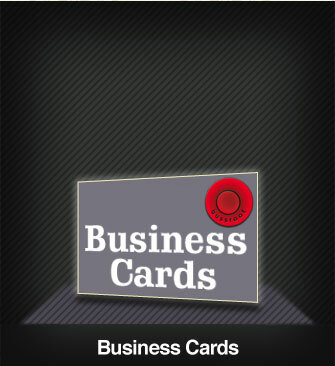 Brief: To highlight the company name and its services through a memorable and punchy design. What We Did: Newton Transport needed an up-to-date website that really showed off their haulage and logistics service. As a family run business we created the two Newton Boys as characters to show their passion for the business at a young age which still flows through their business and company values today. The headers of the website emphasize the personal service, time sensitive nature of the business and precision in logistics. We also provided a photoshoot on site and on the road to make the most of their fleet and warehouse facilities. Brief: We were engaged to develop a website that would raise the profile of their "Commercial Projects" side of the business. What We Did: Keeping a very clean and minimilist corporate feel, we designed a slick sliding header with a subtle colour change on a carousel. We provided them with a facility to upload and manage their most recent projects and highlight their capabilities with a visual gallery. Client: Black Rose Love; A fairytale lifestyle on-line brand, retailing jewellery, exquisite fairy lights and luxury candles. 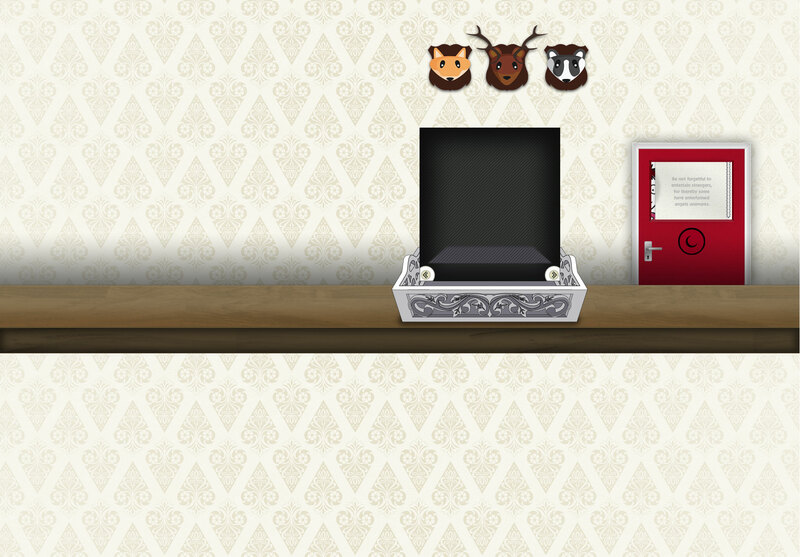 Brief: To create a unique, innovative website with a fairytale like magical quality. 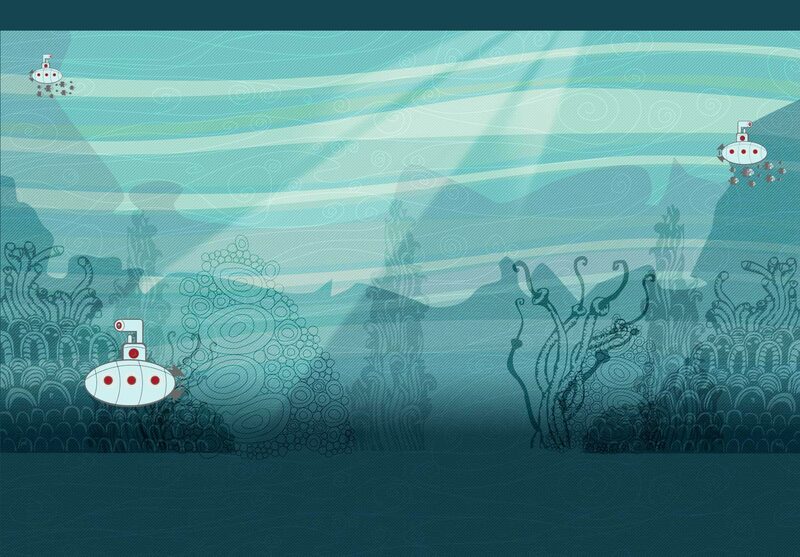 What We Did: We devised a website that was magical scene with animated carousel, cherry blossom, butterflies, where the page turned from daytime to nighttime enhanced with a background sound track running throughout. The functional ecommerce shop gave the customer different images of the product they were interested in and other products they might like for cross-selling. A fully updatable blog/news section was incorporated within the website. Client: MP Payroll Solutions & MP Workforce Management - provides a professional, cost effective payroll bureau service alongside a smart and effective online workforce management tool. 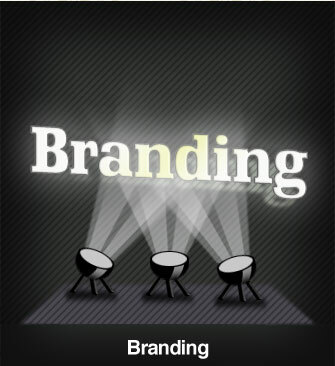 Brief: To produce a new brand with a contemporary and professional look and feel. 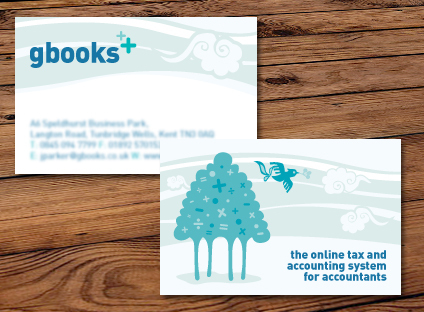 What We Did Produce a brand for both companies highlighting the payroll and HR services. 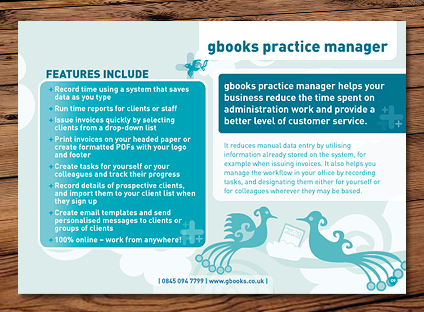 We designed A5 and A4 flyers that were printed as well as supplied digitally to email out. 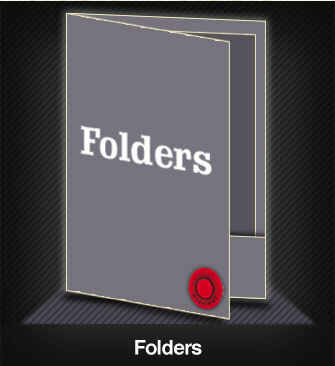 A crisp and clean A4 pocket folder was created to hold the marketing material. A slick suite of stationery both printed and in Word format was produced. Various images to create the brand were supplied with accompanying logos to size for all platforms for social media. Two roller banners complimented the rest of the material to be displayed at exhibitions and networking. Client: Good Food Wines - Is an independent supplier of alcohol to some of the most prestigious names in the food manufacturing industry. Brief: To update the branding and give the company a fresh, vibrant and contemporary feel. What We Did The existing logo that Bussroot produced over a decade ago was still strong in form, so we updated the colours, gave it a new modern typeface and simplified the 'bubbles' so that it would work better for social media platforms. The company has strong ethical values of provenance and building long term relationships with suppliers around the world, to provide a premium product and service. With this in mind we created a 'stamp' icon that could be placed throughout marketing material. Alongside this we produced an icon that portrayed the lifecycle of the product's journey from vine to finished article. Strong imagery was chosen to show how their alcohol products can compliment food dishes and recipies, with catchy straplines 'Add Grain to Grape to Excite Your Plate' and the existing 'Just add Food...'. Client: National Conservation Service - Provides conservation advice, support and care of books, parchment manuscripts, paper objects, archival records, seals and photographic materials; in libraries, museums, archives, and private collections. Brief: To create a recognisable brand that would give a distinctive edge to the organisation and transfer to an ecommerce website and marketing material. What We Did After creating a logo that could be timeless and had a mark that could be used alongside that to boost the brand, we produced a sophisticated and tactile business card. 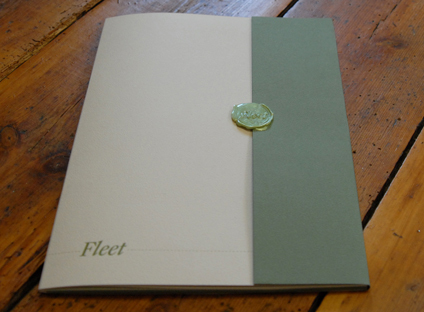 The stock used was a Colorplan mid green duplexed with Colorplan natural 270gsm making it 540gsm when finished. We used a gold foil to the dark green side and a deboss of the logo and logo mark to the natural side. The overall look and feel was classic and modern that complemented the organisation perfectly. Client: Black Rose Love - A fairytale lifestyle brand, retailing jewellery, exquisite fairy lights and luxury candles. Brief: To create a strong brand style that had a mystical vintage look that would flow through into the merchandise, product labels, ecommerce website and marketing material. What We Did We created a magical scene with an animated carousel, cherry blossom, butterflies, and Eiffel Tower with lights to give the tone of the brand. Glitter was added to the business cards with a vintage feel reverse and a pop-up glitter postcard was produced to launch the brand. Beautiful bespoke boxes were created using strong grey and black stripes and the carousel scene within the lid. Client: Beyond the Beaten Track: producers of a range of high quality nutritious ready-to-eat hot or cold ration packs. Brief: To come up with a brand name and identity for a selection of ration packs and outdoor food. The target audience was for hiking, biking, climbing, camping, outdoor pursuits, fishing and extreme outdoors sports enthusiasts. What We Did: We devised the name and brand to emphasise the idea of adventure and that the products are especially configured to meet the requirements of the great outdoors, and to portray that exciting feeling you get from what may be just around the next corner, or in this case “beyond the beaten track”. The strapline “outdoor provisions that go the extra mile” was created to highlight the quality, nutritional value and calorie content that keep you gonig that extra mile or two. 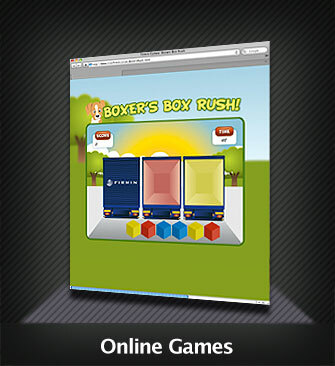 The brand is used throughout the website, retail packaging and marketing material. 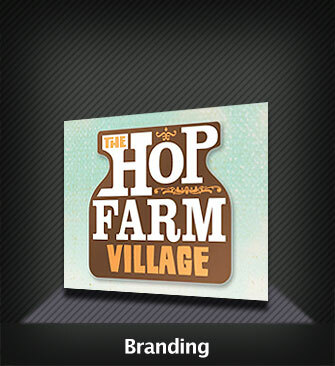 Client: The Hop Farm; Popular tourist attraction in Kent. What We Did: We created a logo, signage, stationery and other marketing material. We wanted the logo to have a home-grown and natural feel to it to reflect the countryside setting. We chose a jar as the logo, a rustic bold typeface and used an organic colour palette. Different colours from this palette were used to identify the different activities and attractions on the estate so as to reinforce the new brand theme. Client: Restore; Experts in document management, data management and records destruction. What We Did: The new Restore logo we created was in the shape of a key, we used the distinctive green and black pallet that are their corporate colours. The key represents both security and the key services that Restore provide. The marketing material highlighted the impeccable services and values that flow through the different divisions of the company. Client: James Pendleton; Estate Agents with branches throughout South West London. Brief: In 2003 our brief was to create a brand for the client's new business venture. 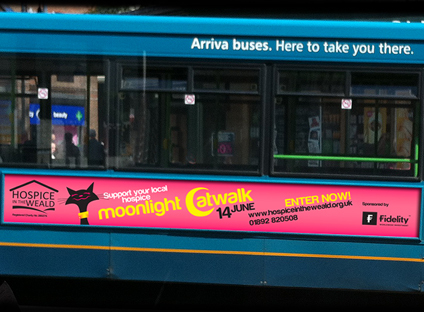 We were also engaged to bring that new brand to the market place through the use of various advertising media. 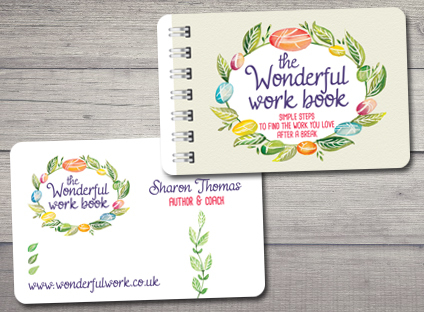 What We Did: With the use of eye-catching colours, design and photographic images we created a new logo, stationery, sale boards, shop design and other marketing materials. The new logo and images were carried on throughout magazine articles and promotional items (umbrellas, water bottles etc). We went on to design a series of posters and hoardings for display at railway stations and at key sites throughout South West London. We designed and produced a variety of unusual direct mailshots to increase awareness of the James Pendleton brand. In 2008 we encouraged James Pendleton to enter the Daily Mail UK Property Awards, in which they went on to win the Best UK Estate Agency Marketing Award. In 2009 they won the prestgeous Sunday times Estate Agency of the Year Marketing Award for the "We Live Here Campaign" for which we created the design. Client: The WellSpring Clinic; a multidisciplinary clinic in Tunbridge Wells, Kent. Brief: To create a brand, logo, website, stationery and marketing materials for this new clinic. To introduce and emphasise the importance of wellness, rather than illness that lies at the heart of the clinics' philosophy and to raise awarenes of their presence in the local community and help communicate the services they offer. What We Did: The brand needed to convey the core values espoused by the practitioners of professionalism, wellness, warmth and a friendly atmosphere. It was also essential to explain, in laymans terms, the large selection of therapies that the clinic offers. 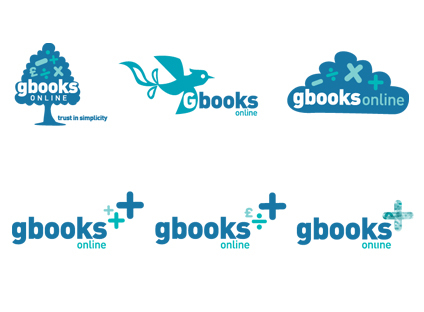 The logo used a soft colour pallet with a heart/leaf shaped icon to convey the natural, caring ethos of the business. ‘The Wellspring Wellness Jar’, full of ‘Simple Common Sense’, was created to highlight the range of specialist therapies that go together to create a jar full of wellbeing. The brand message is designed to clearly convey the message of a modern complimentary medicine clinic staffed by highly qualified professionals who work together to provide the most effective treatment to achieve the optimum outcome for their patients. Client: The Great Tunbridge Wells Bike Ride; a sponsored charity bike ride event. Brief: To advertise and raise awareness of this first running of the event. 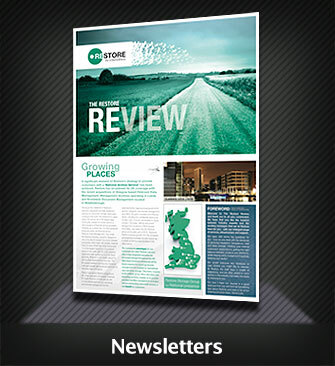 What We Did: We created an eye-catching logo designed to stand out in direct mail, shop windows and banner displays. The logo was based on a cycle cog and incorporated the notion of road safety through the use of strong colours. The branding was designed using a bold, modern, vibrant style to grab instant attention, with a call to action for a wide target audience of any gender, ability or age. Client: Prestige Guarding; Security service covering the South East. Brief: To create a logo, brand, website, business cards and stationery that display a reliable, strong professional image that reflects the company. What We Did: We chose the colours gold and black to express the characteristics of strength and quality that epitomise the company and that we wanted to convey. The gold on the busines cards and the reverse of the stationery really stand out and complement the stylish website we created. The logo was designed combining features of the brand, key holding, manned guarding and dog patrol services that the companty provides and was utilised throughout all the marketing material. 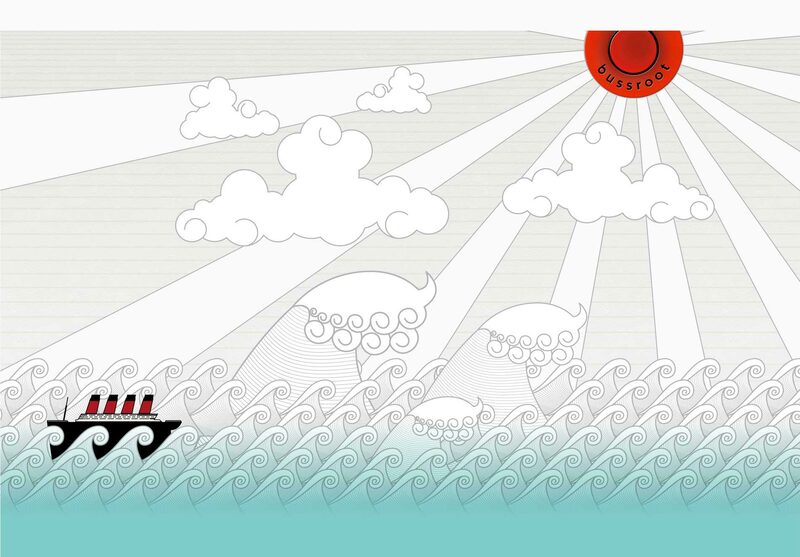 Brief: To create a fun,striking, off-the-wall logo, website and brand to advertise The Funny Farm Comedy Festival. What We Did: We used the oposite colours, red and green and an off-beat typeface to reflect the quirky nature of the festival. We invented various comical animal characters to be placed throughout the marketing material using the same colour combination. We adopted a lighthearted but attention grabbing touch to fulfill our brief. Client: The Plan Shop; Architectural plan creators. Brief: To produce a logo and website. What We Did: Employing subtle and intelligent branding, the structured and angled logo uses typography with two of the letters found in the brand, the final image representing a modern forward-thinking approach to architectural plans. The colours are fresh and timeless, continuing the underlying subtlety of the overall design. Quotations from famous architects were included, to establish a context within which the company operates and to start to build a rapport with potential clients. Brief: To create a new brand and logo for this long established company. The logo had to be timeless, corporate and professional with a modern twist. Restore - Experts in records management, data protection and information destruction. 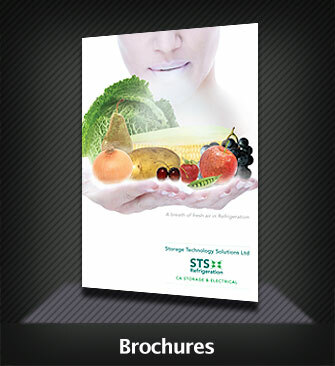 To create booklets that explain the services offered by Restore. Following the journey of a document from creation and storage to its final destruction, emphasising the security and data protection implications. The booklets had to be user friendly explaining the process of scanning, shredding, IT security and secure data removal for those unfamiliar with these issues. They also had to be in a style that could readily translate into video for YouTube. Using illustrations in a story-book format we created characters that showed the life of a document. Using the same format we showed the need for, and the role that, Restore plays in the management of sensitive data in electronic and paper format. We used uncoated paper and textured backgrounds to create a very tactile natural feeling booklet..
Good Food Wines - Independent supplier of quality alcohol to some of the most prestigious names in the food manufacturing industry. To launch a new range of the finest Ales, Ports and Ciders. We created a fictional character, a travelling chef and bon viveur, we told his story as a series of adventures in which he sourced the products. Bussroot produced the copy, illustrations and original recipes in the form of a travel journal finished in gold foil on a leather effect cover. Clinker Little - Consulting accountants and advisors to business owners across the South East. To produce a full colour brochure introducing the "MASTERING BUSINESS SERVICE", offered by Clinker Little. To do this in a way that contradicts the sterotypically stuffy image of accountancy. We created a series of hand-drawn illustrations around a theme to accompany the text. 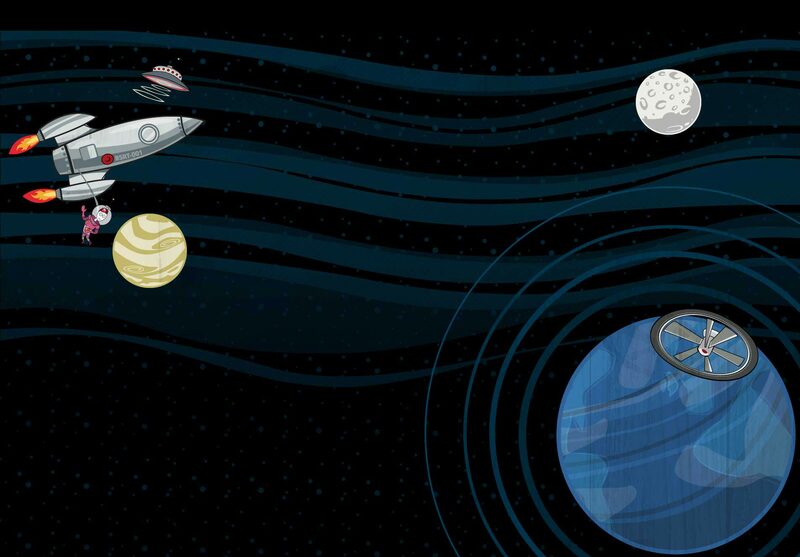 Using the analogy of space flight to parallel business practice, we took the client step-by-step through the key elements necessary for success. With witty intelligent illustration and the use of the client's corporate colours to enhance the process. Senseco Systems - industry-leading independent Fire and Security Solutions company. The UK's first carbon neutral certified fire and security company. To produce a brochure emphasising the company's independent status, its flexibility in meeting client needs, its use of the latest technology, and its eco-friendly carbon neutral credentials. 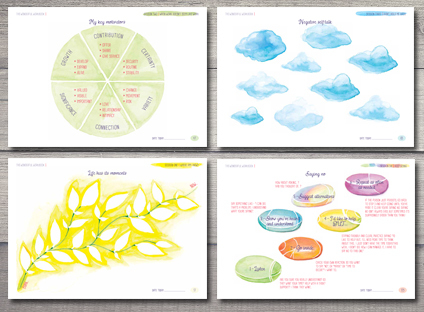 Taking the idea of the five senses, plus a sixth - the ECO sense (SensECO), we created a brochure using both illustration plus photographs to highlight their unique place in the market. 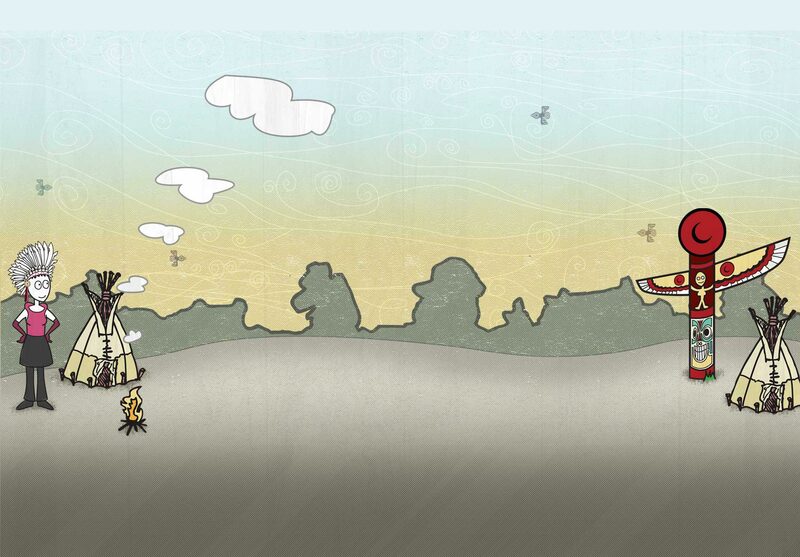 We introduced the Senseco man, an illustrated character that appears throughout as a guide. KM Cleaning - A bespoke professional cleaning service. To create a series of 3 high quality eye-catching brochures, tailored to target specific market segments in education, the finanicial sector and the creative industries. We created a unique design using the highest quality materials, including a quirky "scratch and sniff" area that gave off a lovely fresh scent from an image of an air-freshener. 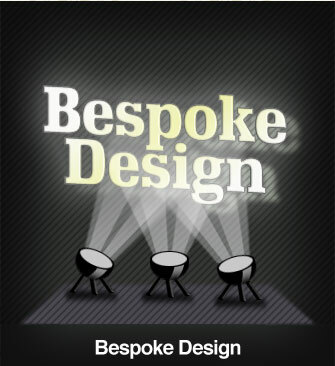 The design, copy and finish reflect the clients ethos and practice of offering a tailor-made service for their customers; presenting them with choice on advice, contact, service and products including enviromnental issues. KM Security - Operate to the highest industry standard, having been awarded SIA (Security Industry Authority) Approved Contractor status and ISO 9002 accreditation with the DTI's 'Tick and Crown' mark. 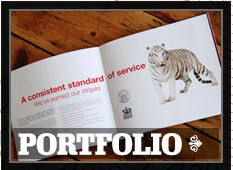 To produce a brochure which encapsulates the values and standards that KM Security operates to. Using compelling visual images and copy focusing on the key themes of strength, vision and power, we created a brochure that both details the company's status within the industry, and lists the elements of security that KM perform including; static guarding, concierge, mobile patrol, keyholding and electronic security. Lucas - One of the UK construction industry's leading specialist fit out and finishing contractors. To create a brochure for both commercial and residential customers wanting a quality, specialist service focusing on their individual requirements. We produced a high quality brochure to match the standards espoused by Lucas where quality of workman ship and materials are paramount. 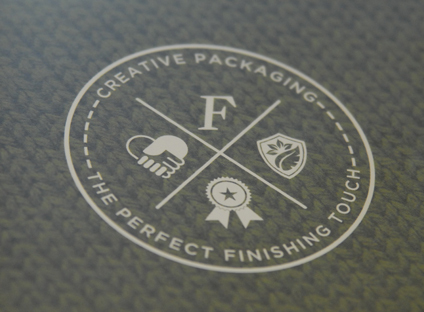 The brochure's cover had a deboss pattern with a Spot UV on a textured uncoated stock with high resolution images and interleaved onion skins to highlight the various finishes they could have. Synergee - Chartered accountants and business advisers based in Tunbridge Wells. 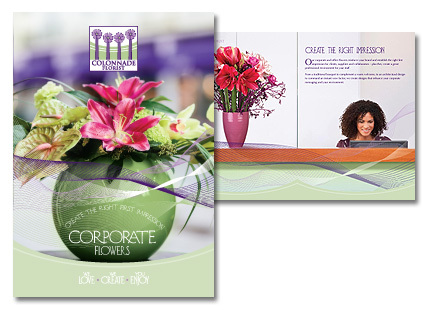 To create a brochure that is unique and memorable that also has the facility to be easily and cost effectively updated. Synergee's logo is a four piece jigsaw representing the four elements that comprise their business development solution. We therefore produced a cover that opened out like a flower, each petal representing one of those elements. 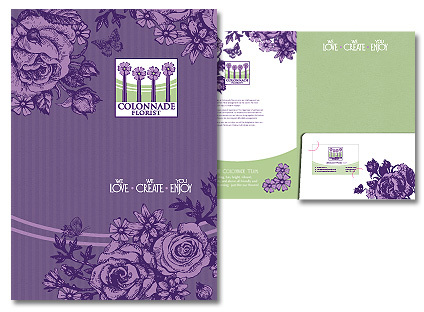 The petals folded around a series of inserts that can easily be replaced or updated. Each insert had a striking image that was used throughout their other marketing materials. The outer cover was printed with a gloss laminate and the inserts on a silk stock. The whole brochure measured 148 x 148 square making it very tactile. Client: Reflex Printed Plastics. Printers that specialise in printed plastics and Lenticular. Brief: To design a "Magic Box", to send to blue chip clients, it was created to showcase the various types of lenticular; animation, morphing, flip and 3D. A comlex design that required the highest quality of both concept and design to acheive the desired effect, the wow factor. What We Did: As specialists in lenticular design, we conceived the idea of the "magic box" filled with items that could be made using lenticular. We designed a hypnitic postcard, a 3D mouse mat, a series of morphing postcards (a cat turned into fire, a gargoyle into a dog, a cat into an owl, and a hand into a spider), a concertina brochure that was a pack of playing cards and a business card that showed a watch movement, lastly a box that cast a spell using a secret magic wand that was found inside. The design, colour, and imagery were thoughtfully chosen to reflect the magic theme and optimise the versitility of lenticular. What Happened Next: At the IAPHC, "Best Use of Lenticular" competition in Minneapolis, The Magic Box designed by Bussroot, commisioned and produced by Reflex was awarded "The Best of The Best" throughout the world. A spokesperson for Reflex said of the award "that by working with Bussroot, who were responsible for the concept and design of the project, Reflex have not only achieved their aim but have been awarded the most prestigious industry award". 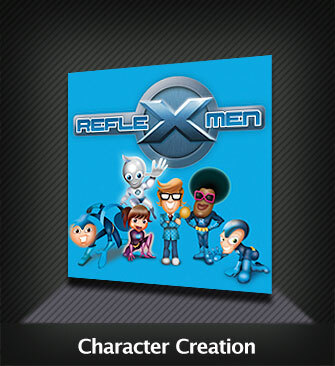 Brief: To design an original, humerous Lenticular Christmas card to be sent to Reflex's clients. To do this in a way that was fun but that nevertheless showed off Lenticular and how it might be used imaginatively. 'What We Did: We came up with the idea of the 'morning after the night before' and designed a pair of glasses in which the eyes appeared as open or closed depending on the angle of the head. They sugested someone weraing them could go to sleep, or just 'rest their eyes' for a minute or two while the glasses maintained the illusion that the wearers eays ware still open. 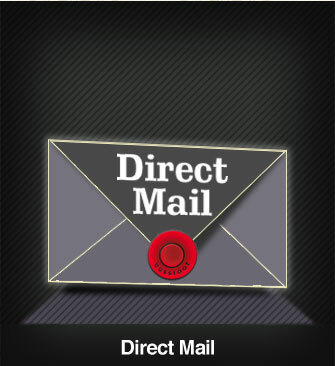 Brief: To create a direct mail campaign to be sent to their clients, called 'reinventing the vinyl'. What We Did: We designed a polypropyline Juke Box that contained a series of PVC coasters made to look like 45RPM records. 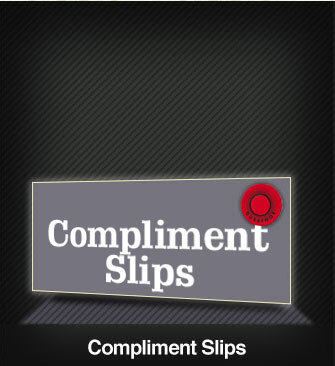 Each record expressed a witty title and artist names to highlight specific products and services that the company offers. 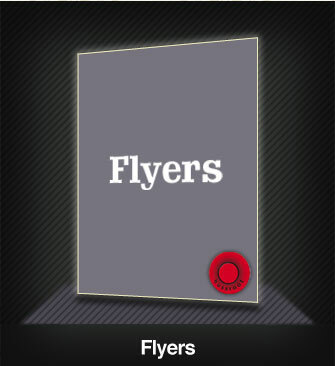 In the second part of the campaign we continued the theme designing PVC mouse mats to look like vinyl albums. Brief: To design an original Christmas card and small gift fto be sent to Reflex's clients, that used ploypropyline in a creative and amusing way. What We Did: Our idea was to design a small box in the form of a book that would contain a minature of Scotch whisky. The book cover was based on the design of the Charles Dickens novella, A Christmas Carol. Inside the box was an extract from the book printed on the inside base. The back cover had a seasonal greeting from Reflex and the front and spine were made to look like the original tooled leather cover with an illustration that bore the title 'Scrooge's Secret Stash'. Brief: To create a direct mail advertising campagnebased on a Hallowen theme, showing off some of the different materials and techniques which Reflex specialise in. What we did: We designed a holographic mirror board box that opend out into four leaves, the cover leaf had a skull design of sparkling leaves and flowers, the skull had the reflex logo on the forehead, the other three leaves bore the slogan 'Bringing Ideas to Life'. The reverse had information about the company and its products. Inside the box were two Lenticular coasters showing a face turning into a pumpkin and a dogs head turning into a gargoyle. The box itself fitted inside a black boxboard box that measured 110mm x 110mm x 18mm. Client: Bussroot. Which is to say ourselves! Brief: To come up with a quirky marketing campaign that demonstrates not only our undoubted design skills but also the way creative thinking can translate into a memorable marketing tool. 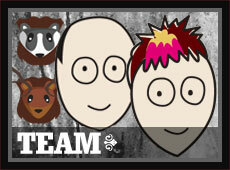 We wanted to show our fun side by giving our clients an unusual view of the teams characters. What We Did: We came up with the idea of creating the Bussroot calender, a calender with a difference. It would go out each year as part of our yearly thank you to our clients, to act as a reminder that we are here to help, and that a new year is coming with its new projects and campaigns that we can be there for. Each year we have come up with a different theme; from Troupe De Bussroot, an original take on some famous masterpieces in art, to Bussroot at the Movies, reinterpreting iconic movie posters, from Bussroot's Greatest Hits, a reworking of classic album covers to The most Spiffingly Wonderful Calendar , a humerous take on Victorian imagery and style. We have a great time coming up with ideas for each month, organising the costumes and doing the photography. After which we get to showcase our skills in producing the final images, every one of which must bring a smile to our faces. What Happened Next: Well, what happened next is that year on year the demand for the calendars has grown. Everybody wants one, our clients start asking us in August if we are going to do another and tell us not to forget to send them one. We also get requests from people who have just hear of them through their friends. The Bussroot calendar has become part of Christmas and taken on a life of its own. 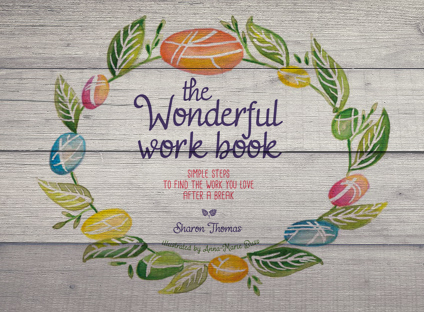 Client : The Wonderful Workbook: Helping people get back to work after a break. Context: A new book that was designed as a workbook to help people get the confidence and direction to get back to work after a long break. The book needed illustrations that would be used to write on for each task that would also create a new brand. 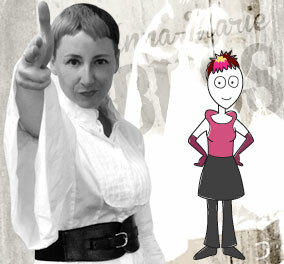 After a long chat with Sharon the author about the style she wanted for the illustrations, Anna-Marie who is also an artist began to practice with different mediums and paper to get the right look and feel. Watercolour paint was chosen on a lovely smooth 100% acid free watercolour paper. Each section needed around 7 individual illustrations and there were 6 sections ranging from pebbles, lime slice pie charts, branches of leaves to flower picture frames. 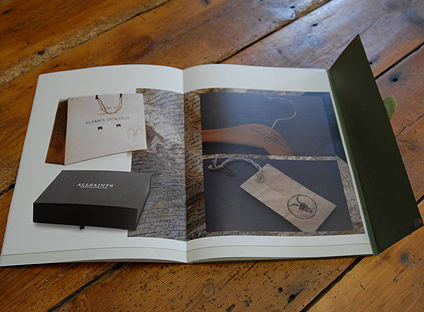 The front cover and a inside pages were created to capture the style and layout of the book. To go alongside the book we created lovely business cards that were minature versions of the book. 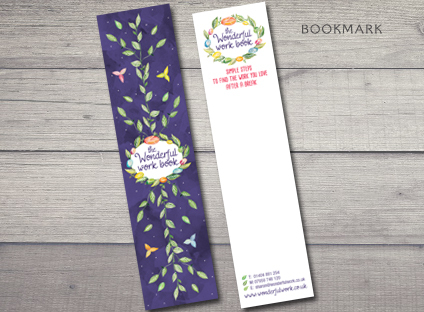 We produced a beautiful bookmark that was printed on a luxury textured paper, this was going to be used as classy compliment slip as well as a nice hand-out at trade shows, exhibitions and networking. 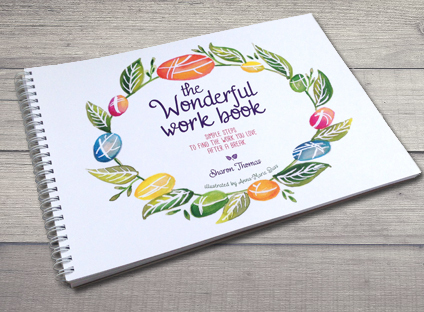 Take a look at the website for more information and where you can also purchase this Wonderful Workbook. 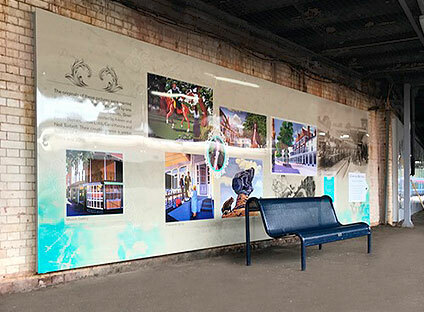 Context: To celebrate the wonderful murals that were painted on the platform in 1989 by Brian Barnes MBE, a new display has been designed by our Anna-Marie. 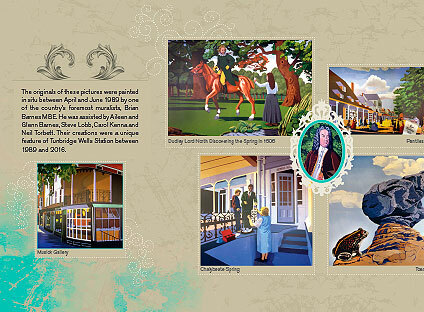 It tells the story of the existing murals and the heritage of the station using the existing images that Brian created along with old photographs and illustrations of the station. Complementary colours and delicate flourishes give the panels movement and seemless intergration. It was a challenging project having to work from Brian's original 35mm transparencies and also the photographs that were over 100 years old, in order to fill an area so large. The retouching work that was performed was very extensive to get the images looking so colourful and sharp and to remove all of the dust, scratches and rogue hairs! 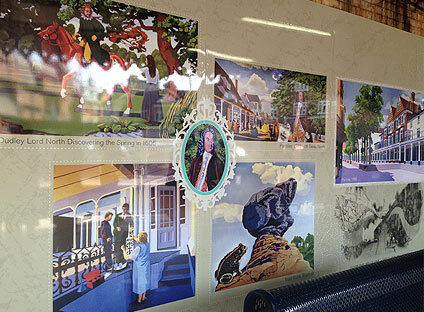 So next time you are on the platform at Tunbridge Wells station take a look and see it up close and personal. We are pleased to announce that Platform2 has just won a Civic Society Award for Public Art. 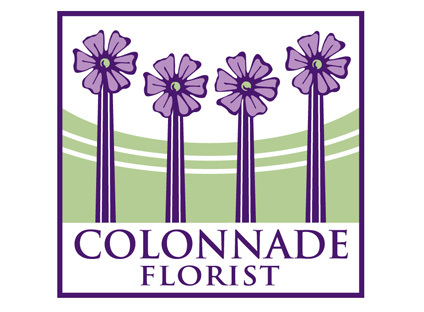 The Context: Colonnade Florist wanted a new look to replace their original bright and vibrant branding. They still wanted an element of the existing logo but to bring it up to date and have a fresh, sophisticated feel. As the name suggests the shop is in a colonnade and so that was a perfect factor to include in the logo. We used one of the original flowers to the logo for consistency and changed the colour palette to a rich aubergine purple, warm lilac and a light meadow green. The strapline • WE LOVE • WE CREATE • YOU ENJOY was set in a graceful typeface and added throughout. 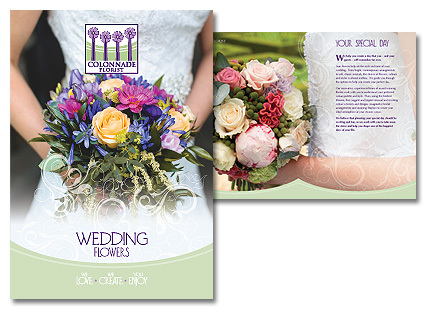 The new brand was applied to a wedding brochure, corporate brochure, stationery and a corporate folder bringing all of the elements together. 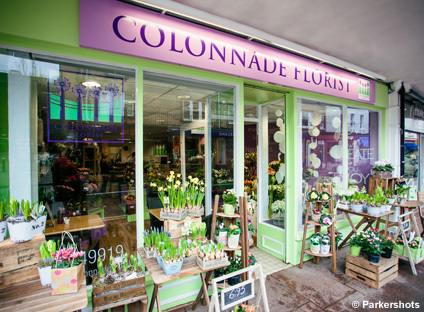 Once the brand was agreed Anna-Marie designed a visual of the shop interior and exterior using the new colour palette for the decorators to work to. This is brought to life with the creative and constantly changing window displays by the talented Colonnade team. Client: Fleet - Manufacture, supply and distribution of luxury packaging and point-of-sale to luxury retail brands. 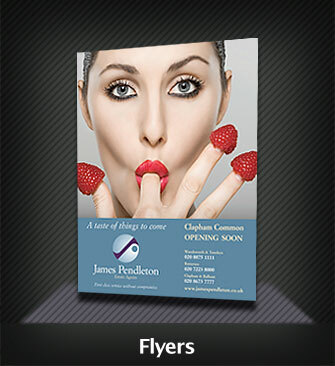 The Context: Fleet required a bespoke presentation brochure to showcase the company in more detail. This needed to stand out against other competitors. be memorable with a wow factor. As with any new client we took the time in getting to the bottom of what they do differently and what makes them stand out from the rest. There were distinct elements that were obvious, absolute attention to detail and quality in design, a really ethical company that cares for the environment. Once we had pin-pointed these factors we were able to apply that into a design. We chose a beautiful paper GF Smith Colourplan with a tactile Morocco emboss in two colours, a natural and earthy ecru and a mid-green that matched their corporate identity, for the cover. This was complemented with a little stitch that ran along the bottom incorporating their logo. 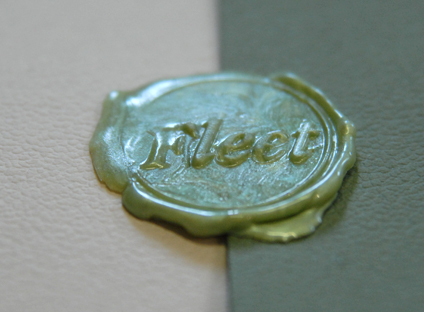 The main focal point was a hand-made wax seal with an impression of their corporate identity in a pearlised light green finish. 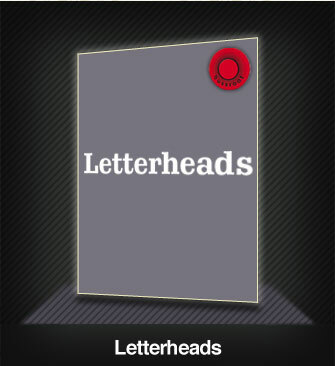 The inside was clean and minimal with a customised "hallmark" that represented Fleet's USPs that ran as a watermark throughout the pages, the strapline created was "Creative Packaging - The Perfect Finishing Touch". The paper was a silk finish with an off-white tint making it feel luxurious and natural. Large images that showcased their luxury bags and packaging ran across the pages. There was a pocket to the inside back cover that could hold any other information that was tailored to the individual receiving it. Client: Hospice in the Weald - The Hospice comprises a 17 bed In-Patient Unit and Day Therapy Centre serving the local community, providing speciallist palliative advice and clinical support for people with life limiting illness, their carers and families. The Context: Hospice in the Weald is a locally based charity that must raise around five million pounds each year to continue to provide their services to the local community. The work we do for them is part of our charitable contribution to Kent. 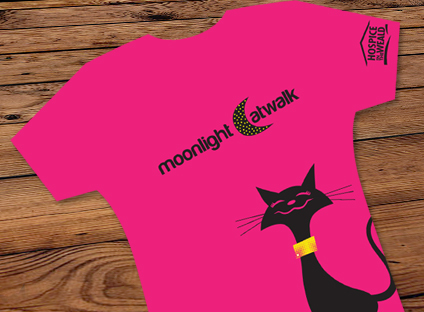 We were contacted to help refresh an annual fund raising event, The Moonlight Walk. 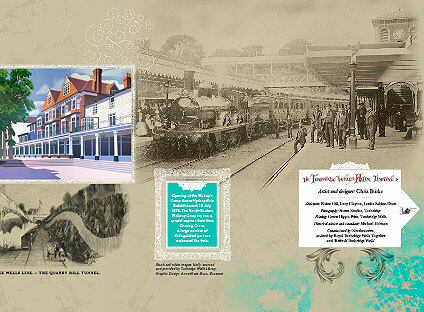 An eight mile walk around Tunbridge Wells that takes place on a moonlit night in the summer. They wanted us to come up with new ideas about how it might be advertised and promoted and how we might create a new look for the event. As a high profile local charity we were already aware of the work done by Hospice in the Weald. However before out initial meting we looked at a profile of events that they put on. We pinpointed the familiar images and colours that they used in their literature and marketing materials to identify themselves. We also researched the type of person who might join this kind of sponsored charity event and looked at how it had been promoted in the past. 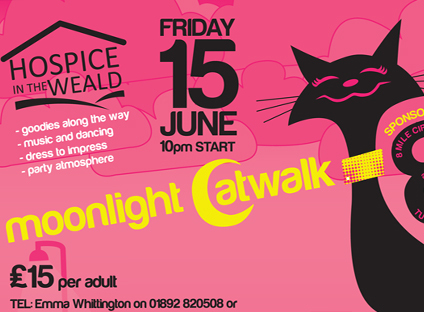 We came up with the idea of a Moonlight Catwalk, our research showed that the ovewhelming majority of participants in this kind of event would be women. We chose to change the colours to pink black and yellow, in a deliberate move away from the previous colours and so help create a new and separate identity for the event whist retaining their logo. We introduced the idea of a catwalk that would appeal to women. This reinforced the association of ideas by encouraging participants to dress up as if for a fashion show. 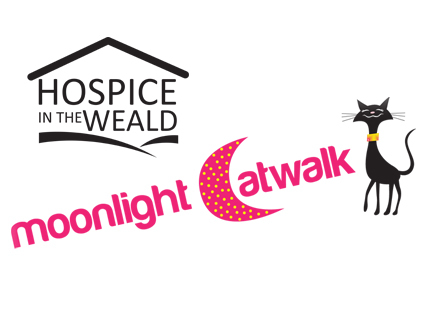 We created an image of a cat for the catwalk, which worked particularly well as the Hospice's mascot was a cat called Luna. 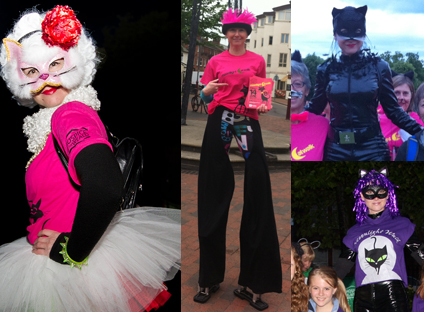 We designed T-shirts, bus advertising and leaflets, which our director, Anna-Marie, dressed up for and wore stilts to help hand out in the town. She also dressed up in an even more outrageous outfit, stilt walking to help entertain the participants on the night to add to the fun atmosphere. 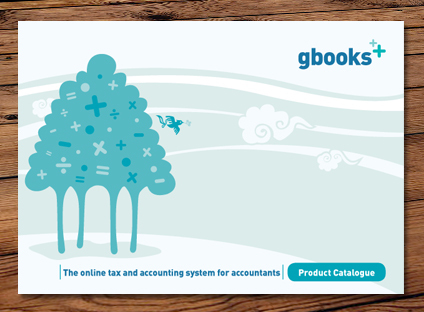 Client : Gbooks Ltd; Specialist online tax and accounts system for accountants. Context: Gbooks was originally created in 2008 as an in-house system for a successful firm of accountants. It was designed to file tax returns and iXBRL accounts both to HMRC and Companies House. The system was so simple and reliable that it is now being spun off and is being marketed to other accountancy firms to help manage their compliance work and practices. We were commisioned to create an identity as part of the process of taking the product into the market place. We began with research, we needed to understand the software and how it would appeal to the niche market that it was designed for. 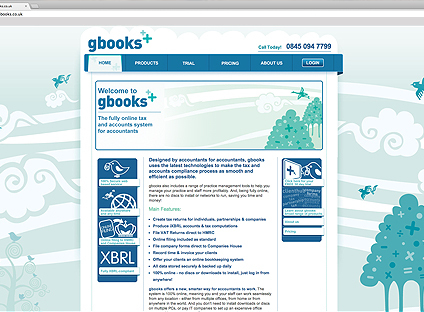 We wanted the design to reflect the simple, user-friendly, functionality of the Gbooks software. We were asked to create a website, logo, stationery, letterheads, business cards and brochure with a different look and feel. We settled on a simple illustrative style and the use of soft blue with turquoise tones to create a pleasing but professional look. The colours and "double plus" logo were echoed throughout the marketing material, reinforcing the positive, professional image that they were keen to display. 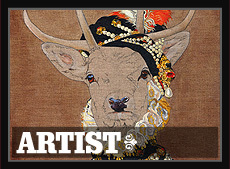 ... but a whirlwind romance is not what we're offering. We want to embark on the design journey of your lifetime. Be assured that the initial magic spark will never cease and a burning flame of desire to fulfil all of your creative needs will never die. 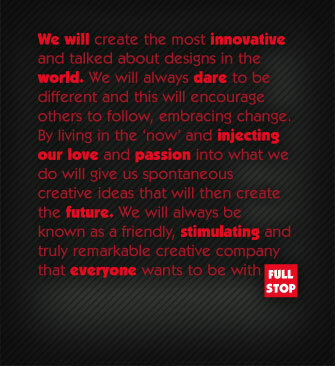 Bussroot is an award winning design agency. We are innovative thinkers versed in the art of design with unsurpassed technical expertise and a real passion for what we do. We cover the full spectrum of projects and services: flyers, websites, stationery, brochures, postcards, direct mail, newsletters, exhibition design, illustration, product launches, corporate identity, promotional items, banners and avatars for social media. We are here to meet the full range of our client's needs, from designing a new logo, to a complete re-brand and re-launch. companies STAND OUT in a competitive market place. Our mission is to create just the right image for your company, enabling you to fullfil your true potential and achieve the success you desire. To achieve this we begin by listening, this enables us to understand what you do, who you are and what your core aims and values are. Understanding you and your business is the key to creating the perfect strategy , a strategy that is tailormade to meet your needs. In our philosophy we measure our success by yours, in this way we have been the creative force behind our clients becoming award winners too. 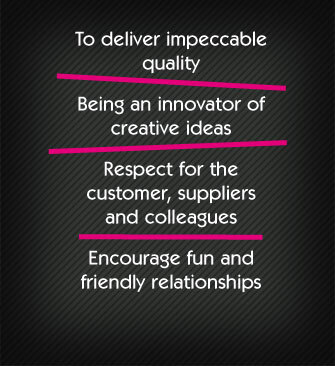 We provide expertise in creative design, to help companies stand out in a competitive market place. Bussroot has its own unique style, which informs our vision. A key strength is our ability to envision a client’s products, services and identity in ways they may never have considered. 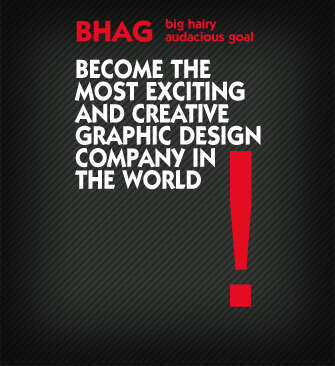 Design should challenge, should shout about you and your capabilities, it should be inspirational. Our mission is to get you noticed, that’s what matters. I have had a life long passion for art and design, at eight years of age I had dreams of being a fine artist, imagining my work in exhibitions around the globe. I began my career in design aged 17 when I got the “lucky break” of a weeks work experience in a busy design studio and I have never looked back. I worked my way up the design ladder and gained a wealth of experience working on highly creative visuals to tight deadlines. It was during this time that I began to develop the unique style that has come to characterise my work. In 2000 I felt the time had come to strike out on my own and so Bussroot was born, dedicated to achieving the twin goals of excellence and innovation. 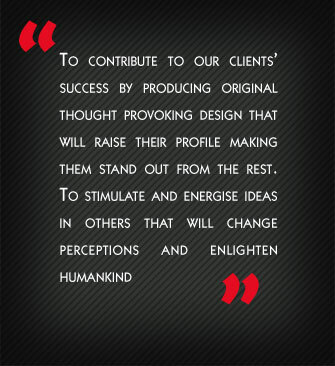 I have a powerful vision, to create innovative and imaginative designs, where quality is key. Since 2000 I have gathered a small, like-minded team dedicated to achieving the same goals, fuelled with dynamism and committed to excellence. 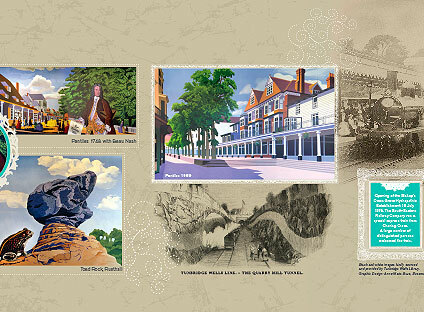 I have an unashamed love for Kent, the county of my birth in which I was raised, educated and have worked all my life. My commitment to Kent is reflected in the ways in which I have tried to put back into the community. For 10 years I was a Director of the West Kent Chamber of Commerce, for 3 years I was on the Kent Economic Business Advisory Board, and I am currently a Kent Ambassador. I believe in the Kent business community, one of my ambitions is to help bring about success in business that will make Kent and better place for everyone who lives and works here. As well as running Bussroot I also run my own art business and sell my paintings in various galleries locally. I work in mixed media and love experimenting with different techniques. My painting style originates from studying the surrealists and love their dreamlike quality and unusual juxtaposition of ideas and images, that are well-crafted and drawn. I welcome commissions for both residential and commercial, so if there is a particular colour palette, a particular subject, a pet portrait or certain style then please get in touch for a relaxed chat. To try not to take life too seriously – it’s always funnier that way. Life is a journey - Take time to stop, enjoy and look around on the way, you never know how much time you’ll have to spend in any place and you never know if you'll visit there again! Stay happy no matter what. Teaching myself to play Alto Saxophone, learning to dance - Lindy Hop and Ballroom (ongoing process!). Walking on stilts whist successfully spinning Poi Poi's! Being a better shot with a bow and arrow than my brother. Designing and delivering the room for “The Bluebell Playroom” at Valley Presbyterian Hospital in Los Angeles - view news clip on YouTube search for Bluebell Playroom. Ironing…what a waste of time! 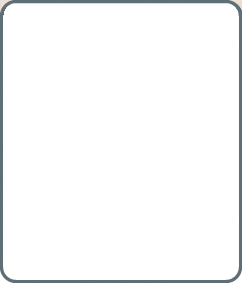 Creased, over-dry laundry from the tumble dryer – Ahhhh! Running naked through the woods! When I was five years old Dad came home with a ZX81 computer, curious and excited by my new toy I locked myself away in my bedroom and taught myself to write programmes until tea-time. So yes I admit I am a true computer geek! Over the years I have been responsible for the build and maintainance of web sites, software and database of all sizes, C and other application developments. Starting my career as a development engineer I have experience of very large complex programs (over a million lines of code!) to database front end management software. 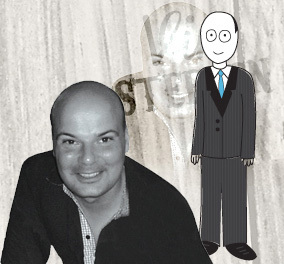 I am experienced in multi-language integration and custom back office solutions to online payment systems and SEO. I have been working with Bussroot for over 9 years now and love the varied creativity that transfers over to my corner, so that I can make it come alive and be seen on the internet. Life's to short to worry about a thing. My beautiful family that bring me new and wonderful experiences everyday. 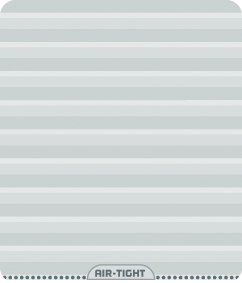 Writing over a million lines of code! Building complex systems from the outset and watching them build and help companies expand and grow. Reality TV shows, they're just too real! At the zoo watching the monkeys, with my little monkeys. Impulse bought a deluxe 1996 World Cup edition of Subbuteo!